Prepare dressing by gently whisking oliveoil and lemonjuice. Add olives,salt and pepper to it and dressing is ready. Soak chickpeas overnight and boil it or canned one also be used. Heat Olive oil in a pan, add onion and tomatoes fry gently. Now add boiled chickpeas,coriander and drops of lemonjuice. Cook for 3 minutes and remove from heat and let it be cool. Now add cucumber pieces to the chickpeas and pour dressing to it. Gently mix the salad and garnish with fresh redchilli. 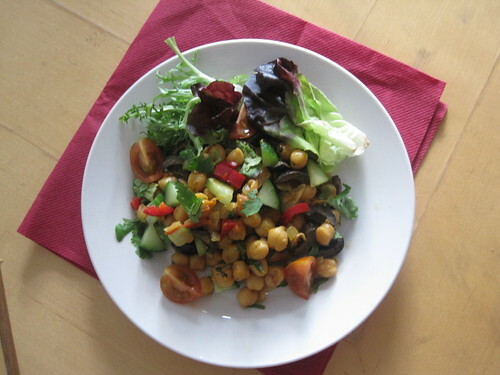 Serve the Chickpeas salad with salad leaves. 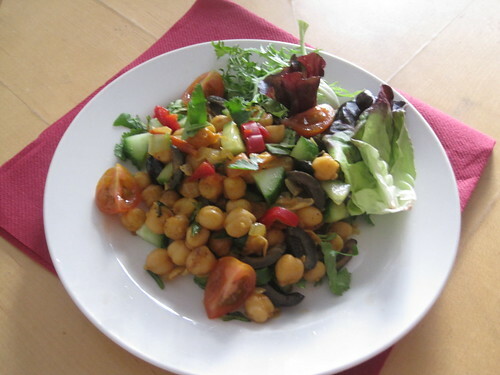 The spicy and yummy Chickpeas salad can be served for evening snacks . Check out my fellow runners in Marathon originated by Srivalli. When I started this salad marathon, I had a chickpea one in mind too. Looks delcious. I love chickpea salads n this sounds yum yum!! hmmm...sounds healthy n divine Ila.. Nutritious salad, i can have it anytime..
Looks so healthy and delicious. hi,i using raw rice u can make use idli rice also for dosa. I love chickpeas cooked any which way. Your salad looks delicious. Yummy and so nutritious... love it !! Sounds delicious! I make chickpea Salad but do not fry it.